RAANANA, Israel (AP) — The charismatic new leader of Israel‘s Jewish religious right is siphoning a large chunk of votes from the prime minister’s party, according to polls ahead of Jan. 22 elections, and if the trend continues, the high-tech millionaire and former commando could emerge as a powerful voice opposing Palestinian statehood. 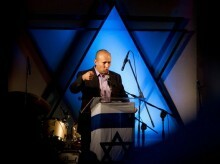 Though Naftali Bennett, the 40-year-old son of American immigrants, is a classic religious hard-liner, comfortable in the settlements he champions, he has been able to draw on his military and entrepreneurial background to widen his appeal to secular circles as well. His sprawling, modern home in Raanana, an upscale suburb of Tel Aviv, is far from the barren hilltops of the West Bank settlers who form the backbone of his support. Philosophically, Mr. Bennett and his party would fit easily into a hard-line government of the type Mr. Netanyahu is expected to put together, though the political newcomer and the Israeli leader — his former boss and political mentor — have a history of bad blood that has deepened over this past week. Mr. Bennett’s campaign has enlivened an otherwise drab election season. The Jewish Home party currently has five seats in the 120-member parliament, but polls since Mr. Bennett took over the leadership show it could win up to 15 in the election. Mr. Bennett says his goal is to broaden the base of his party by appealing to centrist, secular voters alongside the traditional backing of settlers and their supporters. His political message, however, doesn’t sound centrist. “My positions are very clear: I never hide the fact that I categorically oppose a Palestinian state inside our country,” Mr. Bennett told The Associated Press in a telephone interview. In the terminology of religiously devout hard-liners, “our country” means not only Israel, but also the West Bank and Gaza Strip, which the Palestinians hopes to incorporate into a future state, with east Jerusalem as its capital. Mr. Bennett, a father of four, also has an image perhaps more palatable to the Tel Aviv hipsters he hopes to target: success on their secular terms. Political columnist Sima Kadmon said Mr. Bennett’s clean, family image and modern lifestyle blind some of his supporters to his hard-line positions. “Quite a few secular young men and women have fallen into that honey trap,” she wrote. Mr. Bennett rejects the barbs, saying his positions are clear and distinctly hawkish: He opposes a Palestinian state, the uprooting of settlements and territorial concessions that most of the world deem necessary for peace. He’s presented a plan that calls for the annexation of much of the West Bank territory Israel currently controls. Mr. Bennett turned to politics after the sale of Cyota and served as Mr. Netanyahu’s chief of staff for two years. They parted ways after a mysterious falling out that he won’t discuss but that Israeli media have linked to Mr. Netanyahu’s wife, Sara, who wields great influence over the prime minister’s inner circle. He and Mr. Netanyahu clashed again when Mr. Bennett, then leader of the mainstream settler group, fiercely opposed MR. Netanyahu’s decision in late 2009 to slow settlement construction for 10 months in a U.S.-led effort to encourage Palestinians to renew peace talks. This year, he took his positions to the national political arena. Two months ago, he captured the chairmanship of the stodgy Jewish Home party from its colorless leader and set out to transform the party’s image. Mr. Bennett took his campaign everywhere from remote West Bank settlement outposts to trendy bars in Tel Aviv. The strategy worked, and Jewish Home started gaining in the polls. Evidence that Mr. Bennett was a political force to be reckoned with came this week when Israel‘s top-rated comedy show, “A Wonderful Country,” introduced a new character, iBennett: a user-friendly app that shows a broadly smiling Bennett look-alike making extremist political pronouncements — described as bugs in the system. Mr. Netanyahu hit back after Mr. Bennett told a TV interviewer last week that he would personally prefer to go to jail than to obey an order to evict Jewish settlers from their homes under a peace deal, as happened when Israel withdrew from the Gaza Strip in 2005. The prime minister summoned all three major Israeli TV stations for rare domestic interviews and announced that anyone who preached insubordination in the military would not be welcome in his next government. Mr. Netanyahu’s camp then followed up with a campaign of posters and newspaper ads depicting Mr. Bennett as irresponsible and extremist. Mr. Bennett says that his comments have been distorted, that he wasn’t preaching insubordination but voicing his own personal opinion — one that resonates widely within the religious right, which was traumatized by the Gaza pullout. Despite the campaign conflicts, Mr. Bennett insists he can work with Mr. Netanyahu.